The bike I ride most often is the Van Nicholas Yukon. I often times call it my ‘Swiss army bike’ due to the fact that it suits all of my cycling purposes – i.e. road riding, touring, etc. I’ve had it for just over three years now and in that time the Yukon has proved to be trouble-free, comfortable and fun. It’s also eye-catchingly good to look at! The Van Nicholas Yukon is marketed as a fast-paced Audax or sportive bike. It promises comfort, responsiveness and durability. It delivers all of those and more! My first impression when I took it out of the box was that it’s beautifully built and finished. The welds, the embossed logo, the Titanium finish itself – all very impressive. In the design of the Yukon, Van Nicholas also had the good sense to include braze-ons for rear panniers as well as good clearance to fit mudguards when and if needed. While you might not choose to go mountain biking with the Yukon, it’ll handle pretty much everything else. On a weekday ride with the ‘fast’ group, I sit just in behind the “top of the range” road bikes and get to the coffee shop not long after them. On a slower, countryside road ride with the 28mm tires, (Schwalbe Marathon Supreme semi slicks), and the Specialized Toupe saddle, it handles the gravel roads with ease. I’m confident on whatever I find out there, and in Australia, that can mean lots of variations from the road surface, condition and maintenance, to the odd kangaroo or snake. I’ve got a Sram Apex setup with a 50-34 on the front and 11-32 (10 speed) on the back. Where I mostly ride is very hilly with some tough climbs and I’ve never been short of gears. During a recent bike tour in Taiwan, I wished for “just one more gear” on only one occasion – the second day of a 90 km sea level to 3300 meter summit. The last two kilometers to the summit were super tough, but I think the problem was more the legs than the gears! The Sram Apex decision was, for me at least, made mainly on price, as it’s far cheaper to replace if I bang it up somewhere. Having said that, Apex seems to work well once I’d got the front derailleur “jumping off the chain from the small ring to the big” issue sorted. I’ve got no complaints with either the Sram Apex system itself, or the available gear selections. The brakes are caliper style. I don’t have strong feelings or opinions in the caliper versus disc brake discussion. However, if a disc option existed for the Yukon, I would probably go for it. This is my first Titanium bicycle and I’m not one to go on at length about the various opinions, qualities and controversies around the material used to build bikes, but believe it when I hear that “nothing rides like Titanium.” It might be sales hype, I know, but it sounds true to me – especially after I replaced the seat post with a Titanium one from Van Nicholas and noticed an immediate, noticeable difference. There’s enough stiffness in the frame to handle well without being too twitchy, and is also “relaxed” enough to dampen road vibration. It responds to extra effort and always feels like what you put on the pedal goes straight through to the road. It’s obviously a very durable material and almost indestructible. How Does It Ride With Panniers On? When I cycled around Taiwan I used the setup pictured: Topeak bag with attached small panniers, plus extras on the front bar. There was around 15 kgs of gear in total and I’m around 72 kgs myself. Everything I needed was crammed into the available space: tent, sleeping bag, clothes, sleeping mat, etc. There wasn’t a lot of room left over, but it all fit okay. The bike handling improved if anything with the extra weight. Once I got used to the dynamic of having the weight behind me, the ride seemed even truer and more stable than unloaded. Descending was the same, there wasn’t a moment where the added weight had me feeling nervous. The Yukon feels tremendously stable in all situations. In summary, just jump on the Yukon and go! Panniers or not, it’s nimble! The Van Nicholas Yukon is an odd mix of genres, it seems to me, but it works. In the head tube angle (72), the fork trail (70mm) and seat tube angle (73.5) the numbers look on the “touring bike” end, but when it comes to the chainstay length (42.5cms), and the wheel base (101.5cms), it looks more like a cyclo/road setup – a bit more bunched up. The overall effect is that while it’s a reasonably relaxed ride, you do get the feeling of the bike being tucked right in underneath you. 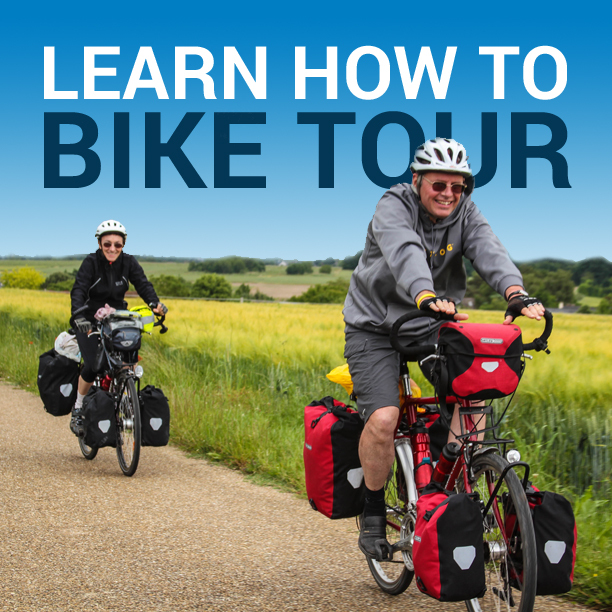 This is especially noticeable when you are out of the saddle (yes, with an adjustment in riding style, and a bit of confidence, you can get out of the saddle with the panniers loaded) – the front wheel release is right below you and at first gave me the impression of being too far forward (overbalancing almost). I don’t think about it or notice it anymore, but the fit is tight. Another “keep the concentration” moment is when descending, because of the tucked up effect, the front can feel slightly unstable if the descent is bumpy. I’m a cautious downhill rider and haven’t had any mishaps, but I’m careful. The result of this overall tight’ish geometry is the very positive reward for effort that comes with the Yukon – what I put on the pedal goes straight to the road. The pros clearly take the prize. While it’s a mid-priced bike, you’ll be riding it for a long time, so you get your money’s worth. Stability, build, handling, durability, quality, genuinely multi-purpose, and comfortable… the pros go on. There has never been a single day that I wished I could get off the bike due to discomfort or any of the multitude of nagging aches and pains we’ve all experienced. The only con I have (which is probably a consequence of the tight geometry in the wheel base and chainstay length), is that there is about 1.5 cms of toe overlap on the front wheel, highlighted especially when the mudguards are on. I’m used to it now, but it takes a bit of getting used to and requires adjustment to the riding style, plus full concentration whenever you have to negotiate intersections, sudden stops, or it’s late after a big day out and so on. I’ve only fallen off once, at an intersection, in a group. It all looked pretty clumsy, and I felt a bit of a novice, but no harm done. On another occasion in Taiwan, my toe hit the mudguard, which took quite a deal of time to repair afterwards, (the mudguard that is!). I think that if Van Nicholas ever re-designed the Yukon frame, a couple of centimeters extra up front to cut out the overlap would be a great improvement, if they haven’t already done so. 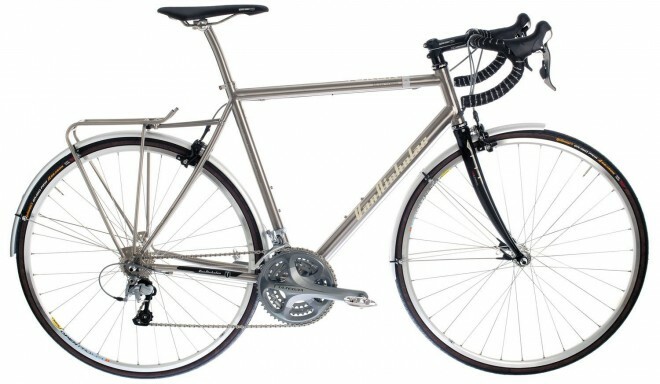 The Van Nicholas Yukon is a fabulous titanium “all-rounder” for the rider who does a bit of everything. It’s well worth the money! Just watch the toes and the bumpy descents. This entry was posted in Bicycle Touring Pro Articles, Bicycles, Featured Articles, Guest Posts, Main Articles, Product & Service Reviews, Products and tagged bicycle review, bike review, sram apex, titaium bike review, titanium, titanium touring bicycle, touring bicycle, touring bike review, van nicholas, van nicholas yukon, yukon, yukon bicycle review. Nice write-up. I too love my do-it-all Yukon. Mine is equipped with 11 speed Ultegra 6800. I’ve crossed, audaxed,sportived, raced, TTed, even Hill TTed(!) on it. I have never toured on it yet, but intend to non-camp tour later this year in northern europe. I put a Ti tubus logo duo rear rack on (nicked from my VN touring bike), which is super light and will couple with a pair of Ortlieb front roller pluses. Always wondered how it would handle loaded, so nice to read your positive comments. Thanks Barry. The wheels are as supplied when I bought the bike. They’re Mavic Kyserium and they are stiff but not overly so. I’ll take your comments along if/when I ever decide to upgrade anything. I’m away at the moment for three weeks riding some big days in the Victorian (Aust) mountains and it’s all working well. Cheers.